Ah, the perfect side part. There’s hardly anything more sophisticated than a combover haircut. It’s timeless, it’s elegant – and it complements quite a few different face shapes. 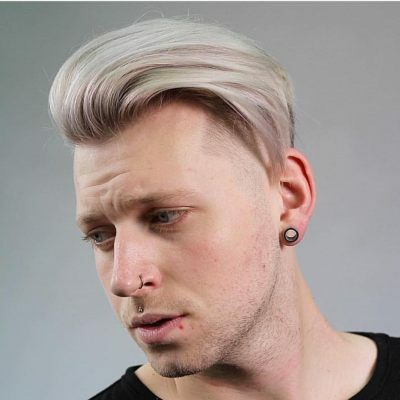 Many have fallen head over heels for the charming combover – from talented legs like David Beckham to high-pitched voice owners like Justin Timberlake. 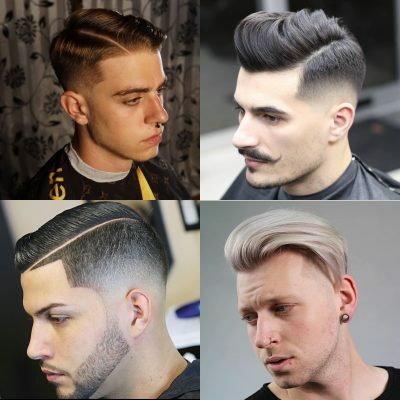 And today – we’ll share with you our 10 favorite combover styles, along with tips on how to style them. The best news is that styling a combover isn’t as complicated as nailing other beloved haircuts (pompadour, quiff, etc.) – and the style can be achieved in about 5 minutes (ish). 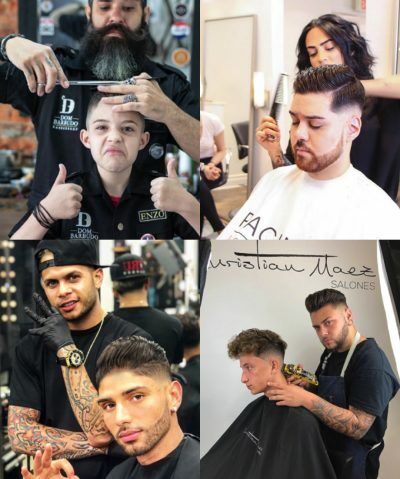 You’ll need to ask for a low fade cut at your barber’s, which will most likely involve clipper sizes 0 or 1, slowly working it up to longer hair as you get to the top. This particular style is all about volume! Start with clean and damp hair – and blow dry it while brushing your hair to the side with a round brush. Once the hair is nearly dry, apply a little bit of your styling product – pomade or wax (tip – don’t overdo it!). 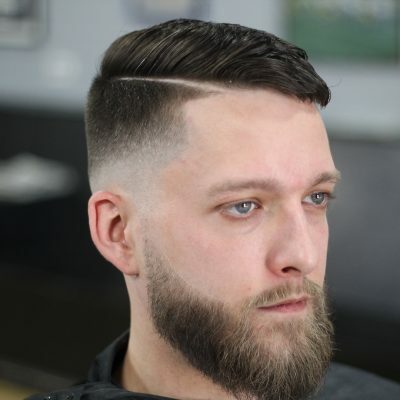 This type of combover requires more styling in the barber chair than the first – but the result is awesome! 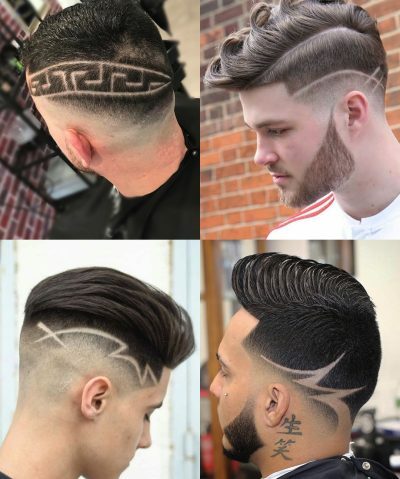 Ask your barber for a quirky shaved design – best to bring along a photo for this type of intricate hair work. 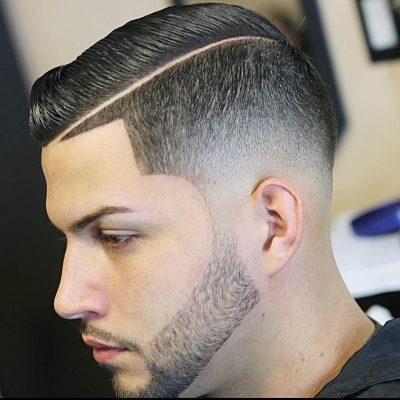 The fade starts with clipper size 0 and hair will increase in length as it moves up. For styling, begin with damp, towel-dried hair. 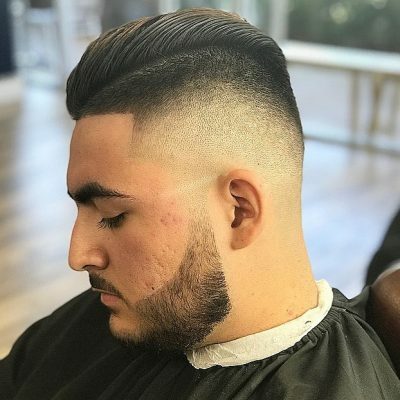 As this is more of a classic “wet” combover look, grab some wax or pomade instead of drying it with a blow dryer – and apply it, thoroughly working it through your hair. Use a wide toothed comb for the parting – and then, for smoothing the hair down . 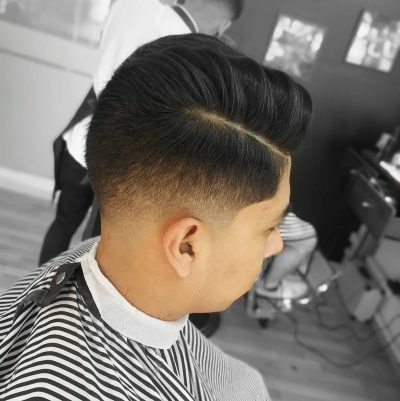 A high fade combover is ideal for someone looking for a brave fade haircut with an elegant motif. Ask for a high fade cut, which will leave your sides almost shaved with a little bit more hair closer to the top. This is another look that closely resembles the classic combover – so we won’t be using a hair dryer. Simply grab some wax or pomade and work it through damp hair, applying it thoroughly (but not overdoing it!). Use a wide toothed comb to find your natural parting, then smooth the hair down once you’ve achieved the perfect side part. Short hair or long hair – combover doesn’t discriminate and will work perfectly on both lengths! For short hair, you’ll ask for at least a couple of inches left on the top. This particular cut is combined with a medium fade. Styling is simple – simply apply pomade to damp hair and follow the same steps as above. Find your natural parting and fix it in place with a wide toothed comb. A great example of the perfect side part on medium length hair! 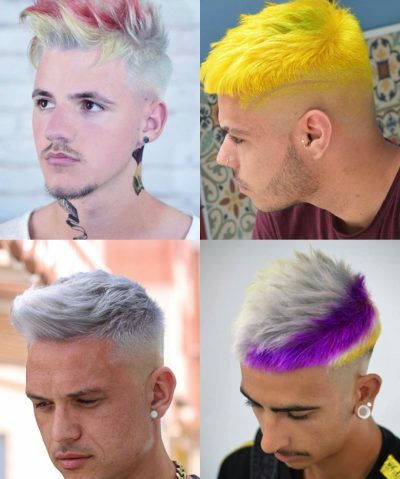 You’ll want at least 3 or 4 inches of hair left on top, and the sides to be faded. High, medium or low – you decide. 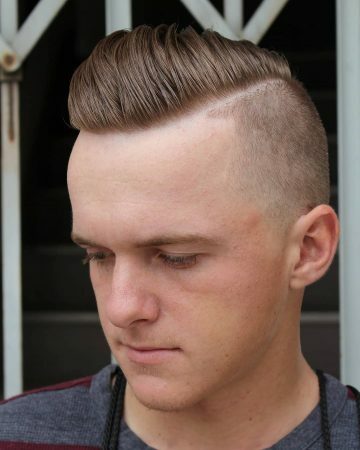 This particular haircut has a sharp, low fade. To style, apply a styling product – remembering to rub it between your hands before using. Distribute the product evenly, without tousling much – this is a particularly neat combover. 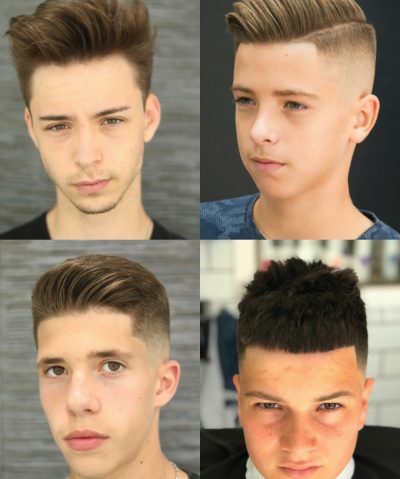 Comb hair forward and find your natural parting – part it away from the line and push it to the side of your head. Finally, comb the product through that larger section of hair. Most hairstyles look good on long hair – particularly a long combover. You’ll need to have resisted a trip to the barber for at least a few months to have achieved this length. 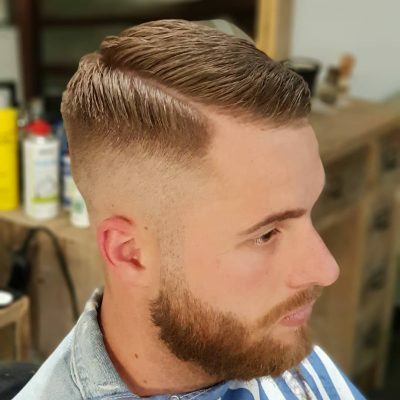 Ask your barber for tapered sides – as you can see, they’re quite a bit shorter than the top, yet no fades or undercuts. This hairstyle won’t require as much product as the shorter ones. Start with damp hair – and apply a bit of smoothing cream or serum (if you’ve got some to hand!). Find your parting, then blow dry your hair to the side. 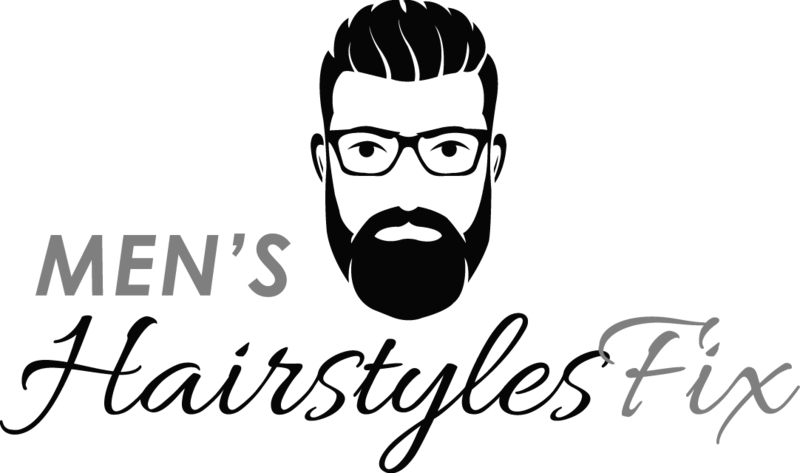 Once the hair is nearly dry, apply a tad of pomade – and you’re done! 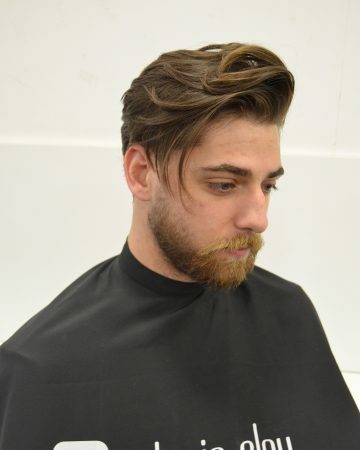 A little more eye-catching than the other styles, an undercut combover will create a more noticeable contrast between the short and the long. Ask your barber for an undercut, which will leave your sides neatly shaved. 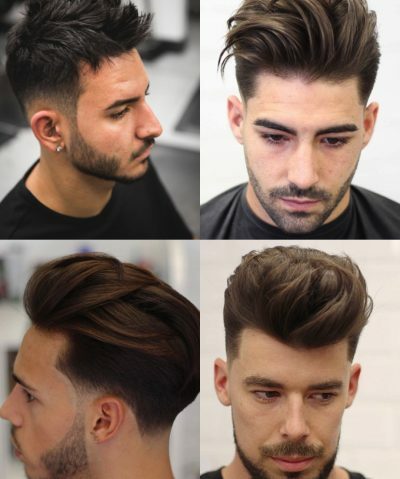 Styling this won’t be difficult – and even easier than with other styles, as the parting is created for you during the cut. Apply some pomade to damp hair, work it through the length – and voila! Benefits of a short combover? Easy to look after (obvs!) 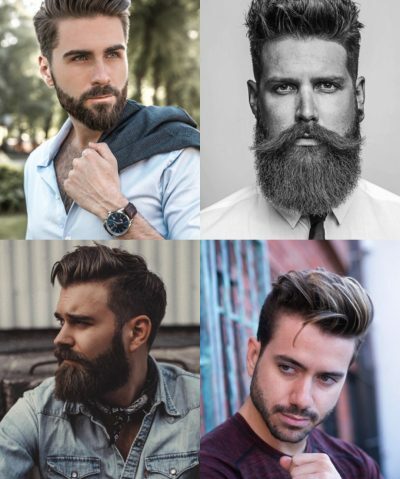 – but it also gives you a chance to sport your best facial hair without the look being overwhelming. Ask for a mid-fade and at least an inch or two left on top at the barber’s. Style damp hair with pomade or wax – and remember to find your natural parting. Your barber will help you find it if it’s been missing – and you should stick to that. What a sophisticated combover this is! 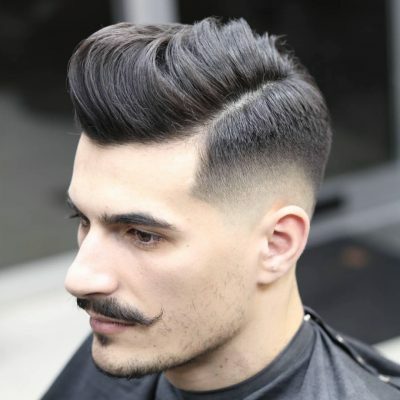 The look is quite eye-catching because of the sharp disconnect – the short-undercut contrasts quite strongly with the long top. You will need a lot less product for this guy – and you can simply apply it to hair that’s been blow-dried. Remember to apply a smoothing serum – you’ll need that to maintain the smoothness. Last but not least – this is probably our favorite. Meet the classic combover – the charmer that’s been around for decades. 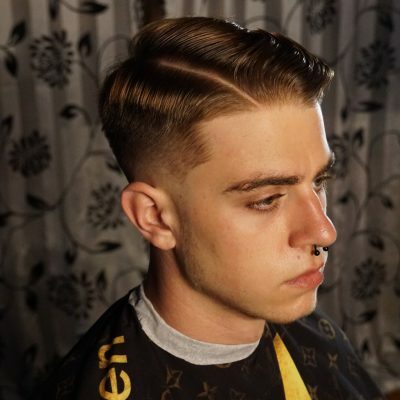 Jazzed up by a medium fade, this hairstyle combined edge with elegance. High shine pomade is key for this look. You’ll also need a smoothing serum or mousse, which can be applied before you use your blow dryer. Finish up with some high shine pomade – and let those compliments pour in!